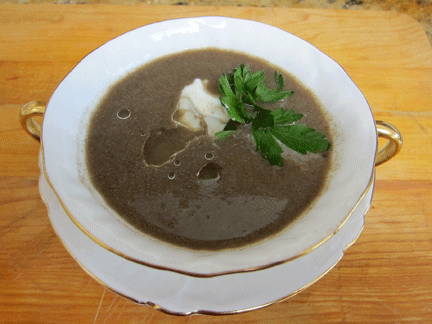 This easy recipe for mushroom soup contains no cream and makes a light and delicious starter for fall and winter dinner parties. I’ve been serving it for over twenty-five years! It can be prepared a day ahead and reheated. In fact, the flavors improve when reheated. As my cooking skills have improved, I have experimented with different sorts of mushrooms. Remember when “mushroom” meant only white button mushrooms? Think outside the box, like “hen of the woods” or some other exotic wild mushroom combination. 1. Place mushrooms in heavy soup pot without water or oil. Cover and cook over low heat for 15 minutes, or until the mushrooms reabsorb their liquid. 2. Add butter in small pieces. When melted, sprinkle with the flour. Cook over medium heat, stirring, for a few minutes. Slowly add chicken stock, stirring constantly. Simmer for 10 minutes. 3. With a slotted spoon, transfer mushrooms to either a blender or food processor. Add the sherry and blend until smooth. Add a 1/2 cup of the soup base, if needed, to produce a smooth purée. 4. Return puréed mushrooms into the soup base, reheat, season with sea salt and white pepper. 5. Garnish each serving with a dab of crème fraiche, and some chopped flat-leaved parsley and a drizzle of truffle oil. I love the simplicity of this recipe and its lightness. I bet it would be delicious with barley, too. Good idea! That would make it more substantial for a “soup meal”, my favorite fall lunch. Great idea for an easy weeknight soup. We get some great mushrooms from PA/Amish country. Will be making this soon! I grew up in PA Dutch/Amish country – lucky you to visit! if I didn’t already have dinner plans for tomorrow I’d go to the Mission Hills farmers market and get some different mushrooms to try with this. Maybe next week. The mushroom guy there is great! In fact, I used his porcinis for the photo here…How is grand-baby girl? Hope you guys enjoyed the pink champagne – couldn’t resist! Great recipe. Love your new blog! Especially the family photos. You have really developed an inspiring site here. Many congrats! Thanks so much, Annaliese, I am just getting started but having lots of fun with it. Welcome!